Celeste Super annoying, but not too much of a threat since both of you should be at opposite sites of a fight. You both will be poking each other without much risk of dying in the lane. Remain cautious of Solar Storm while fleeing or beginning a team fight. Petal You can easily kill her munions with Heliogenesis. Petal has great range. It will be hard to harass until your level 8. Her Spontaneous Combustion with obliterate you. Be aware. Adagio If you are going to be caught in Adagio's Verse of Judgement, immediately place a Core Collapse right under his feet. Fortress Beware of ganks. Truth of the tooth allows for the enemy team to quickly reach you from the brush. Place a scout trap in the bush, so you know when he is waiting. Joule Joule can be very dangerous. Move around to avoid Thunder Strike and Big Red Button. Try stunning her when she is using her ult. Catherine Avoid targeting any tanks during team fights. Her stun and silence can be detrimental to your ability to inflict damage. Skaarf He is very dangerous to go against. He can consistently hit you with his Spitfire if you are not moving around. Strongly advised to get boots early. If you have a crucible or aegis, use reflex block during his Dragon Breath. Skye Just like Celeste, Skye relies on skill shots. Stay mobile and harass with Helioes. She can easily get behind you with her Suri Strike, so you should stay relatively close to your turret. Ardan The Gauntlet is an absolute blood bath. It will be hard to survive unless you can reflex block out of it. Glaive He can knock you into very bad situations with his Afterburn. This can lead to many deaths. Be very careful while in lane. Getting boots earlier is a possible solution to being ganked. Ringo Never be near Ringo when your health is low because he can easily kill you with his Hellfire Brew. Other than that, he is quite easy to harass as long as you KEEP your distance. Vox Vox has a great burst. If it is a CP Vox, make sure you get Aegis. Krul If you are alone and see Krul, just run and hide. He is a monster with a health bar that is beyond deceptive. If he is attacking an ally, use Core Collapse to stop him from getting stacks. Phinn Phinn can be very dangerous. His kit allows him to bring the fight into close range. Since Celeste is squishy, it is hard for her to escape. Rona Rona is super strong and can be super tanky. Her lifesteal makes her hard to kill. If is is not attacking you, try to take her out. If she is targeting you, run. Koshka Koshka is just like take, but can't go invisible. Do not go near Koshka early game. She. Will. Destroy. You. Taka Taka is very sneaky and has very high burst damage. Use your Heliogenesis to reveal him hidden in the brush and take advantage of your hero ability, Julia's Light, to keep him revealed. During the beginning of the match, you should stay focused getting last hits on the lane minions. Try not to use up your energy too quickly or push too hard. Poking enemy heroes will not do too much early game and will hinder your farming and use up energy. When you have enough gold, go to the jungle shop instead recalling to the base. Time your shop trip so you don't miss out on killing many minions. You can do this by leaving lane once you clear a wave. If you see a team fight (or a potential team fight) in jungle, you should help, as long as you feel like you can get there in enough time and be effective. It can be dangerous if you get there after your teammates die. The longer you are out of the lane, the less gold and experience you will receive. It is very important to get to level 8 as quickly as possible. By then I recommend having the 5th upgrade to Heliogenesis to gain its increased range and 1.4 second cooldown. Use this ability to harass enemies and kill minions at a safe distance. Protect your first turret. Tell your teammates if you need to recall, so they can keep an eye on lane if your turret is in danger. If you are at low health and you know your turret will be taken down if you leave, stay behind it and use your Heliogenesis when the minions and enemy heroes are close. Celeste is very squishy. Stay on the edge of every battle and spam your Heliogenesis. You should always check brushes with your Heliogensis before entering. This will help prevent ganks. I recommend placing a scout trap in the brushes below both sides' first turret. Stay vigilant and keep checking your mini map. Avoid a 1v1, unless they are in lane with a nearby ally turret and/or at low heath. Eve of Harvest gives 10% crystal lifesteal (25% during first 600-1200 (lvl 1-12) points of damage to enemy heroes). This ability will sufficiently supply your energy and the additional crystal power will provide some nice damage. The lifesteal is very helpful during team fights when every second counts. Obtaining a Broken Myth will push your damage beyond what any extra damage item can provide. Every second you are in battle with a hero, you gain an extra 6% crystal damage (max 36%). The shield piercing (10%) and crystal power (70) is an extra bonus. Clockwork increases max energy and energy recharge as well as cooldown reduction. The formula for the new cooldown is Time=Ability Cooldown / (1 + Reduction). So with the clockwork, Celeste's A ability is reduced to .9 seconds, B becomes 12, and C goes down to 47 (assuming level 12). Shatterglass gives 150 crystal power. 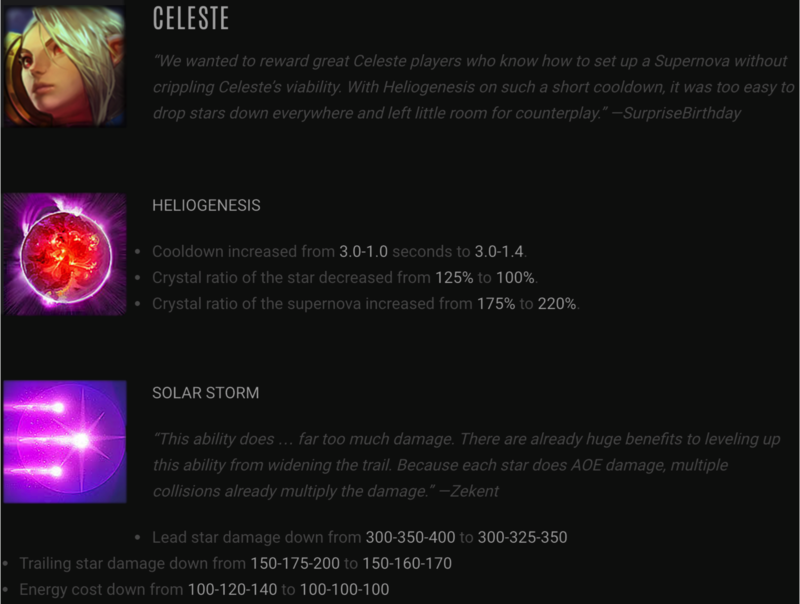 Celeste relies on her crystal damage to succeed. Her basic attacks deal 65-115 (level 1-12) and her Heroic Perk gives an additional 50% crystal ratio. This means for every shatterglass, her basic attack damage will gain 75 points. This item applies a slow (10% slow + 1% for every 10 CP with a max of 35%) onto the enemy heroes. With the new emphasis on landing your super novas more than ever, it helps that the enemy will have a hard time escaping the blast radius. Frostburn also allows Celeste to chase escaping prey. Boots are pretty important in this game. You should get sprint boots at your first or second trip to the shop. This will help when escaping at low health. Travel boots will give a great passive speed boost. This is very helpful when moving across the map. Journey boots should be your last item bought. The passive heal allows you to avoid recalling back to base even when your health gets low. If you can avoid combat with enemy heroes until you have a sufficient amount of health, you will have saved a good chunk of time. Activate to regenerate your teammates' health during a large fight. Crucible gives an additional 600 health. This item will be useful if you tend to die a lot. The active portion of this ability is reflex block for you and nearby allies. This blocks up to 25% of missing health damage for 1 second. While the barrier is up, all debuffs are blocked. Use this to block enemy ults. Aegis is high in shield. Shield reduces crystal damage received. If 2 or more enemies are going crystal then you should build this item. If only 1 of them is going crystal you can still build Aegis if that enemy is your biggest threat. The active is a reflex block that only shields you. Metal Jacket is like Aegis, but for armor. It provides 170 armor and 35 shield. This greatly reduces damage from basic attacks (except from Celeste and Vox). Check your enemy builds and see if they are going weapon damage. This item does not provide bonus health nor an active ability. I highly recommend buying the crystal infusion when a major team fight is approaching. You will automatically consume them if you have all item slots filled. Infusions last 2.5 minutes and give you a huge power boost. This is Celeste's most important ability. Use Heliogenesis to get last hits on minions. This ability will eventually allow you to clear a whole wave of minions in two uses. You should prioritize this ability over Core Collapse when upgrading. Once you get to level 8, you should have this ability maxed. This will help a lot with harassing the enemy laners and keeping them away from you, your minions, and your turrets. The picture on the left is the range for levels 1-4 of Heliogenesis. The one on the right is the range when you max this ability. Place your Heliogenesis in the brush to reveal hidden enemies that would like to squash you. You can see here that a Taka was hiding in a bush ready to assassinate. Placing your A in a brush will save your life a lot. Use your Core Collapse on enemy heroes. Tactically use them to stop them from running away, chasing you, and using their ult. Since it is an AOE ability, you can stun miltiple heroes. Save teammates by properly placing a Core Collapse to stop enemies from chasing. If you are successful, you will be rewarded with a thumbs up or a smiley face. Adagio and Celeste were running from a 3v2 fight. Core Collapse was used to get some distance between her ally and Ardan and Catherine. There was a good chance that he wouldn't make it out if Catherine was able to use her Merciless Pursuit and get off her stun. Timing is crucial for this ability. It may take many games before you get used to the stun delay and predicting the enemies' direction. It is a nice feeling when you stop Adagio by placing a Core Collapse while his charging Verse of Judgement. Solar Storm is a very powerful attack. It can turn an important team fight around. In this battle, Solar Storm took out two enemies in a team fight and left a favorable 3v1. The stars will pass through enemy minions, jungle minions (except for minion miners, gold miner, and Kraken), and ally turrets. It doesn't do any damage to enemy turrets and 50% damage to non-heroes. Solar Storm is a global ability. This means that it can be launched from one end of the arena to the other end. Do not be afraid to try and steal the Kraken with it. If you are able to get the last hit on the Kraken you can turn a grim match into something promising. Thanks for checking out my Celeste build and guide. If you liked it, hitting the thumbs up button at the top of the page would be a huge help. Feel free to comment with any questions, suggestions, or just to chat. Good luck and have fun.